Why doesn't the ICC throw the rule book at Muralitharan and Akhtar? Cricket watchers have, of late, been witness to an unprecedented number of no-balls being bowled in the international arena. Strangely enough, not all of them have come from the bent arms of the “chuckers” at the bowling crease. The International Cricket Council, which – for all practical purposes – is the final authority on the game, has itself been guilty of bowling a few off the field. Earlier this year – more specifically at the end of the recent Australian Test series in Sri Lanka – the ICC suddenly called into question the bowling action of Sri Lankan off-spinner Muttiah Muralitharan. I say “suddenly” because the controversial matter lay dormant for almost a decade after an initial burst of outrage from Sri Lankans when Australian umpire Darryl Hair no-balled Murali for his suspect action. The latest investigation, triggered by a confidential report to the ICC from match-referee Chris Broad, raised more than a few eyebrows not only for the circumstances in which it was conducted, but also for its findings. Before we get into the details of the investigation, a backgrounder for the uninitiated. In cricket, a bowler’s action – and therefore his consequent delivery – is deemed illegal or a “no-ball” if it involves the straightening of his bowling arm at the elbow at the point of delivering the ball. In other words, if your arm changes from a bent to the straight position as you bowl, you can – and should – be penalized for “throwing” or “chucking” the ball. Cricket history is replete with examples of chuckers – the most memorable for Indian fans being West Indian paceman Charlie Griffith whose bowling nearly killed Nari Contractor at Barbados in 1962. Chronic chuckers either continue playing by mixing such deliveries cleverly among legal ones or correct their action or simply fade away from the scene. Australia’s Brett Lee and Pakistan’s Shahid Afridi are living examples of the first ilk, India’s Harbhajan Singh of the second kind, and Sri Lankan Kumara Dharmasena of the third. Although the obvious chuckers can be detected easily with the naked eye, newer technologies – notably the frame-by-frame slow-motion replay facility in television – are capable of exposing even the slightest deviation from the norm. Two of the most talked-about instances of chucking in modern-day cricket are the bowling actions of Muttiah Muralitharan and Pakistan’s Shoaib Akhtar. Is this because sophisticated technology is showing up cases which would have gone unnoticed in earlier times? As a general explanation, yes. But in these two specific cases, hardly. On the contrary, the surprise is that these bowlers continue to bowl the way they do without being pulled up, despite the scrutiny afforded by such equipment. And also despite several former cricketers of repute openly questioning their action. India’s past captain and one of the world’s greatest ever left-arm spinners Bishen Singh Bedi, who is prone to hrefer to a spade as a bloody shovel, has in fact gone on record to say that Akhtar and Murali are not bowlers but javelin-throwers. Using this orthopedic jargon, the two Boards, with the active connivance of the ICC, have successfully hoodwinked billions of cricket fans worldwide into believing that Murali and Shoaib are freaks of nature who developed into geniuses with the cricket ball. The freak-of-nature label is a formidable one. It zips up the mouths of critics forever because no one wants to be seen as a cruel and heartless so-and-so who ruined the career of a physically deformed but promising bowler. The reality is, in fact, just the opposite: Murali and Shoaib have been literally enjoying a field day, while other bowlers struggle in this batsman-dominated game to take wickets with legal deliveries. And talking of freaks, they aren’t unheard of in cricket. India’s B.S. Chandrasekhar took heaps of wickets with a polio-affected arm and Tiger Pataudi excelled as a batsman and captain even after losing an eye in a car accident. But the crucial difference is that neither Chandrasekhar nor Pataudi sought any concessions because of their physical handicap. Chandra never chucked. He actually bowled with a sling-arm action which is the antithesis of chuckingand nobody ever overheard Pataudi asking the opposition bowlers to bowl slow at him. They played within the laws of the game, and if Chandra got an extra tweak because of a flexible wrist, well, it definitely wasn’t an illegal advantage. Then why aren’t Murali and Shoaib being asked to play in the cricket-for-the-handicapped series with its own set of rules, and are instead showcased as stars in the game’s regular format? The reasons are complex and multi-layered. There is of course the question of big money. As performers and entertainers, Murali and Shoaib draw crowds to stadiums and viewers to television-sets in much the same way Shane Warne and Sachin Tendulkar do. Take Murali and Shoaib out of the scene, and you are left with two sub-continental teams with a largely sub-standard bowling attack and in the danger of wilting against stronger teams from elsewhere in the world. As individuals, both have their unique personal charisma. 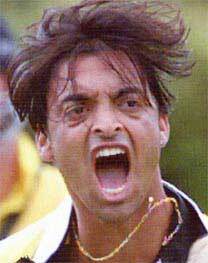 Shoaib is infamous for his off-the-field antics which include, but are not restricted to, zinging across Rawalpindi city on a high-powered motorcycle and getting into fisticuffs. People love to hear such big-boys-play-at-night stories and, as was the case with England’s Ian Botham and Akhtar’s own compatriot Imran Khan, the colourful escapades (real or imaginary) somehow liven up proceedings on the field as well. That’s part of what sporting stardom is all about. Murali is, in some ways, diametrically opposite. His charm is his good-boy reputation (ever heard of this soft-spoken guy involved in a drunken brawl? ), and his continued presence on the cricket field has a strong socio-political rationale. Sri Lankans idolize him as a national treasure responsible for giving the self-effacing people of a small island a palpable sense of pride and self-worth on the world stage. Every wicket he takes is another stride that his relatively young nation-state takes towards international glory, leaving behind its long history of colonial submission. As the lone Tamilian in a predominantly Sinhalese team, he is also the shining symbol of Sri Lankan unity at a time when the country is being torn asunder in a civil war sparked off by Tamil separatists. A spectacular caught-and-bowled by Muralitharan is worth more than a dozen arduous rounds of peace talks between President Chandrika Kumaratunga and LTTE honcho Prabhakaran. Only at extreme national peril can Murali be dropped from the Lankan team. But why should the ICC be a willing, if indirect, party to the cultification of a Rawalpindi street ruffian or care for the internecine ethnic squabbles in Sri Lanka? Especially considering that the ICC is not overly famous for being sympathetic to errant Asian cricketers? Recall the umpteen times that players from India, Sri Lanka and Pakistan have been severely penalized with fines and suspensions even as their white-skinned opponents get away with light tap-on-the-knuckle warnings for demonstrably worse reactions to being adjudged out or to rejected appeals – and you get a sense of why the ICC has acquired a racist taint. But the colour of big money is neither black nor white nor brown. And so, the august body, while flagrantly castigating individual Asian players for seemingly innocuous misdemeanours, appears wary of taking decisions that would jeopardize the mass-appeal of Asian teams whose fans have collectively made international cricket officialdom as rich as it now is. Result: the stars in these teams merrily transcend the pale of cricket laws. And big money means big deals. 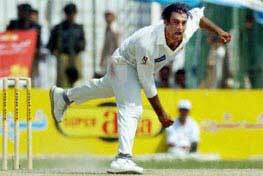 What, one might ask, happened to a confidential report believed to have been submitted by a panel of experts on his suspect bowling action soon after Shoaib Akhtar debuted in the international cricket circuit? Perhaps the ICC can enlighten us. 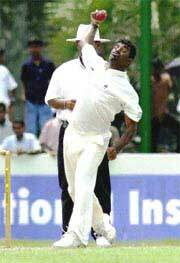 It can also let us know why Umpire Darryl Hair, who no-balled Muralitharan for chucking way back in 1996, has never again officiated in a match involving the Sri Lankans. And why Chris Broad, who blew the whistle on Murali’s bowling action more recently, was promptly replaced by Mike Proctor as matchreferee in the ongoing series between Sri Lanka and Zimbabwe. Which brings us back to the latest investigation against Muralitharan. Has there been a greater sham in world cricket? The tests on Murali’s action were conducted in a laboratory in Australia. In a laboratory! It is one thing to call up the bowler’s TV clips recorded during a match without his knowledge and analyze them with the help of physiological data culled from the bowler’s arm. It’s quite another – and quite moronic at that – to ask him to bowl again in the lab in the hope that he will replicate his match action perfectly in controlled conditions. The “control” here is the bowler’s, not the tester’s. Bowlers at the international level are seasoned enough to bowl differently (i.e. with different arm actions) in different situations. With his entire career at stake, would you expect even the good-boy Murali to give away his only real weapon? Australian keeper-batsman Adam Gilchrist protested against the tests on this very ground. His statements are as direct and uncluttered as his explosive batting. And remember, Gilchrist is one straight guy who created history when he walked to a leg-before appeal in the 2003 World Cup semifinal. The conclusions based on Muralitharan’s lab-test results were even more ridiculous than the setting in which the tests were carried out. The ICC ruled that while Murali’s arm was bent less than five degrees when he bowled his “normal” off-spinning delivery and was therefore okay, it exceeded this allowable limit when he bowled his “doosra” – a delivery which takes the ball in the opposite direction after it lands, as if it were a leg-break. 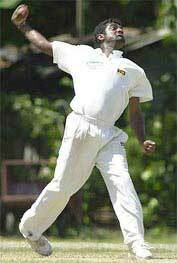 It has therefore decreed that Murali cannot bowl the latter kind of delivery. Amazing, isn’t it! To begin with, granting this five-degree limit for bowling actions is flawed in principle. The ICC has in effect cravenly bent the rules of cricket because the bowlers in question continue stubbornly to bowl with bent arms. It is somewhat akin to a student being given grace marks (within a limit stipulated by the examining authority) to help him or her to make the passing grade. The vital distinction of course is that such grace is granted keeping in mind the student’s overall academic ability and his/her performance in other tests. It is downright dangerous to adopt such a measure in cricket. Simply because it will encourage rampant chucking at all levels of the game. After all, who will keep a realistic check on whether a bowler’s arm keeps within the five-degree limit? Would it be humanly possible for an umpire to detect violations of this limit with the naked eye in the course of an ongoing match? Would it be feasible for match organizers to arrange for equipment that would instantly detect the violations during play? Have such user-friendly machines been invented, let alone developed on a large enough scale? Or will the data have to be transmitted to a laboratory in Australia for complex and elaborate testing before an umpire can no-ball a bowler for chucking? Questions, questions. As for Murali, some more questions. When will we ever know if he violates the five-degree limit? And will he be no-balled every time he bowls the away-going delivery? What if he can actually manage to bowl it without violating the limit? Will he have to apply to the ICC for a re-examination? And what if a delivery bowled with his so-called normal action hits a crack or an uneven part of the pitch, and goes the other way? Would that be deemed a no-ball too? And what happens to the bowling records he has amassed in his career? Do we now replay all those wickets and weed out the ones he captured with his “doosra”? Interestingly, what do you think Murali did when told about the ban? He cocked a snook at the ICC decision and proceeded to bowl the same “doosra” innumerable times in the very next match. His wicket-keeper and close-in fielders applauded every such delivery. And no, he wasn’t no-balled. Is the ICC waiting for him to hreform on his own? Someone high up in the ICC hierarchy should see through this entire nonsense, and stop it before it snowballs into widespread mayhem. You can outlaw deliveries, which are say, beyond the reach of batsmen or which can potentially do them physical harm. But it’s ridiculous to ban certain deliveries on the suspicion that they have been bowled with an improper action and allow other deliveries from the same bowler delivered with a similar, if not identical, action. If a bowler has a suspect action, suspend him till he corrects every delivery. And why allow a bowler to bowl even with a fractionally bent arm? Has the human race evolved to a point where straight-arm bowlers have become an endangered species? The compromise doesn’t make for sane, rational thinking. It’s a truism that laws aren’t, and shouldn’t be, written in stone. They should be open to change as and when they outlive their utility. Has the time come for cricket to stop being cricket? 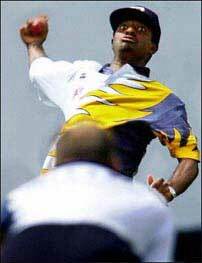 One of the finest sights in all sport is a bowler with a smooth rhythmic run-up delivering the ball with an arched back and a flawless straight-arm action. At its best, it’s nothing short of poetry in motion. But the ICC is all set to deprive us of this hrefined pleasure in its quest for short-term profits from thrill-seekers who just want to see stumps rattled and batsmen bamboozled – and never mind how the ball was bowled. We may as well stop playing cricket altogether. And start playing its crude cousin, baseball, instead. What then will Murali, Shoaib and others of their ilk do? In case they find no foothold in baseball, I’d suggest we wait for the Athens Olympics later this summer. We might find them competing for their respective countries – in the javelin-throw event.